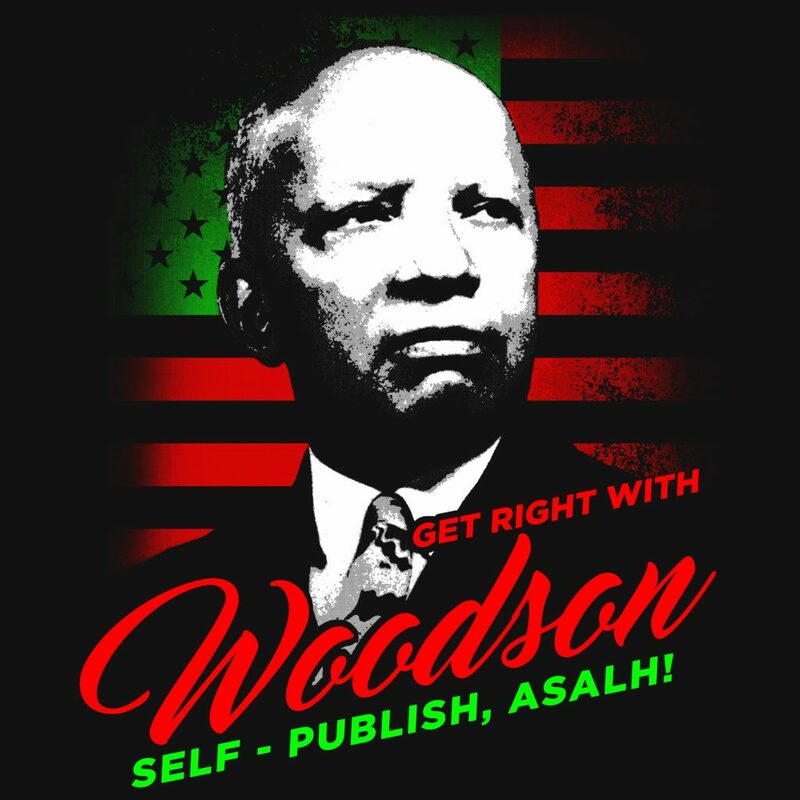 ASALH Politics – Page 3 – Get Right with Woodson Keeping the tradition vibrant! Much can be said about the Executive Council Meeting of February 24th, but the Regime is denying that the 102nd Business Meeting in Cincinnati has authority over the decision to self publish the Journal of African American History or take on the University of Chicago Press as our publisher. Pretending that they still have the issue, they are ignoring the much more profitable self-publishing option made possible by the changes in JSTOR’s Current Journals Program. Never mind that there is three times the profit is self-publishing. Yet the truth about the superiority of self-publishing is not clear because the Regime is not interested in putting out a projection of the revenue versus expenses for going to the University of Chicago Press. After more than four months since the 101st Annual Meeting, where Gilbert A. Smith represented $100,000 of revenue as profit, he has still not provided the math. There still is neither a cost-benefit analysis or a set of expenses that will remain during the period of the proposed Chicago contract. The latter takes perhaps more work than then regime cares to perform, but the latter is something that a head of household can produce. If one did not know better, the board will vote to go to Chicago without numbers. 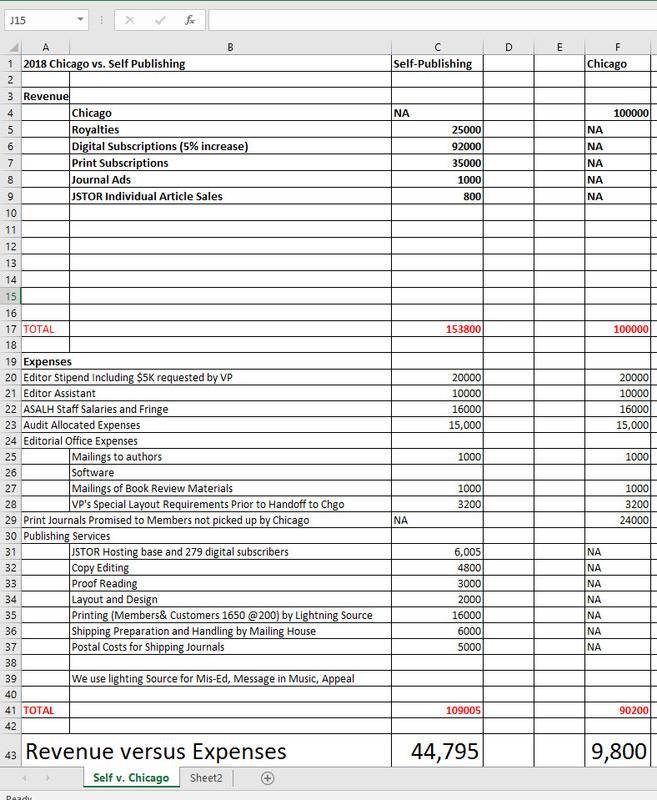 Why Not Present a Draft Report with Everything but the Trivial Amount? We hear that the numbers are not definitive yet because the current expenses are not accurately known. Gee, how did we get this far if the board has no handle on the numbers? And Chicago is poised to make the deal even though it admits it does not have good numbers. The numbers in question have to do with the current revenue and expenses for print subscriptions. The other expenses are well known and make up the bulk of the expenses, indeed, the provisional numbers would only change the bottom line on print expenses by roughly 10% to 20%, or $600 to $1,200. It all involves whether we ship out print an additional 30 or 60 customers. It is a trivial expense. Some might call it akin to spoilage. What Reason or Reasons Would There Be to Not Presenting a provisional Draft? Well, there is no good reason since the report would be between 98% and 99% accurate. The problems are twofold. Such a report would demonstrate that the Chicago Proposal is almost $200,000 less profitable over five years than self-publishing. It would be also be the proof that Gilbert A. Smith, CPA, misrepresented revenues as profits–in a very major way. Those who believe in self-publishing produced a comparative report using the same base of data. The Executive Council revealed itself once again more concerned about being on the best terms with one another regardless of how the membership, the legislative body, has been lied to as it was in Richmond. Never forget that Gilbert A. Smith told the standing-room only crowd at the 101st Business Session that $100,000 in revenue would be profit. 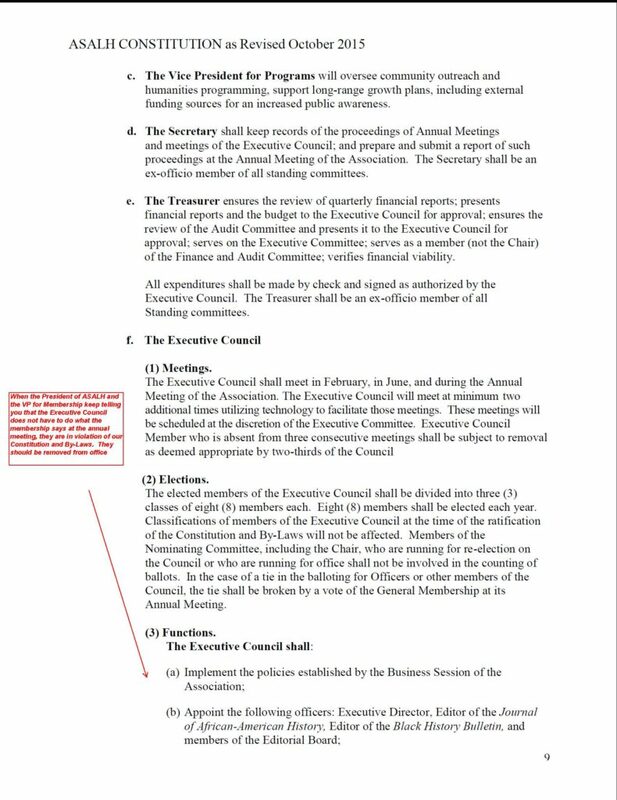 Clearly taking issue on my blog and social media posts about the treasure’s mischaracterization of the $100,000, a board member called for a vote of confidence in the treasurer. Gilbert easily won the vote–imagine that–despite never addressing the issue of revenue and expenses! And the board was aghast that roughly a quarter of their members–mostly new–voted no confidence. The board was audibly surprised and upset by the number of new board members who were not on board with the sell out. The truth is, you cannot get many people to sign on to the sell out. Indeed, I was surprised at a couple of people who put their sympathy for Gilbert A. Smith above his role in lying to the membership by knowingly calling revenue profits. Yet, everyone on the board should know that they are at odds with the membership on this question. And Chicago should take note. The people selling out tradition will be sent packing from the board. Too many of these folks are here to be self-important at our Annual DC Black History Luncheon. That becomes clearer every year. For months those of us opposed to the move have argued that the journals are currently as profitable as the Chicago offer, especially when the journal’s remaining expenses are charged to it and when the price of the so-called free journals are added. Their Bae, we knew, has made no such promise. They don’t love ASALH like that. It’s about future positive revenue for them, and they will only spend so much in pursuit of it. We also put $55,000 on the table for a reserve fund against future revenue decreases until we could put the journal on more stable financial footing. These prudent measures had no effect on the love outs on ASALH Executive Council. Functioning like a regime, they continued their plans to love out, ignoring our legal assertion that because there was still a motion on the floor of the Business Session. Their contention remained that only the Executive Council had the authority to make the decision, and yet they knew their power over the council was waning. New members had been elected precisely to stand for self-publishing. We were poised to slog it out in today’s Executive Council meeting just like that, then JSTOR dropped a bomb. In response to the University of California Press and the University of Chicago Press both leaving their Current Scholarship Program, JSTOR is ending it. It was predicated on a 25% charge for marketing and other services. To keep new scholarship alive and flowing into its main product, their archive, JSTOR has decide to function purely as a journals host. This will save ASALH over $20,000 a year. The effort to secret this program from the Executive Council failed, and now it is manifestly clear that self-publishing is a better financial move than going with the University of Chicago Press. The financial outcomes of self-publishing get better in 2019 as we are able to reduce our costs because we are self-publishing. 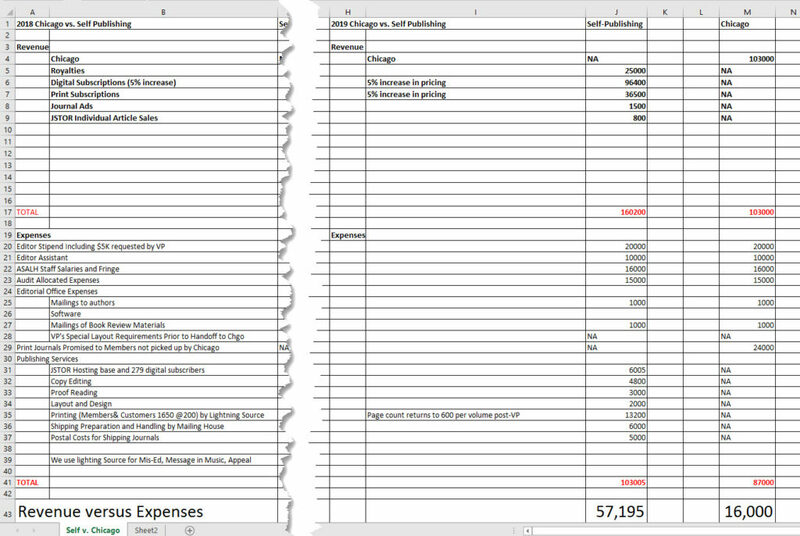 Some of the expenses associated with VP Franklin’s unique editorial style and the creep from 600 to 800 pages per volume can be remedied. This can be done not by cutting articles published but by reducing front and back matter, publishing reviews digital only, and ending the unnecessary indexes not needed in the digital age. Where Is the Due Diligence of the Regime? The regime enters the Executive Council meeting today without having provided the members of the board any of the things associated with such a major change in operations. We have been self-publishing for a century–a hundred plus years–and none of the following has been proffered to justify the move. No history of expense-revenue reports that are produced quarterly. No face-to-face meeting with the proposed publisher. Chicago, the regime says, was given the charge of handling our affairs with JSTOR, their competitor. At best, this was incompetent and a violation of the board’s fiduciary responsibility. We have heard rumors that the University of Chicago Press representatives might appear in person, but we have heard conflicting rumors that they will at best Skype in. We believe it will be the latter because there is not any money in this for Chicago. As I have written elsewhere, this contract for Chicago represents an effort to control a catalogue of intellectual property and build an archive. The efforts to sell back tiles to existing customers stands virtually little chance to let them make of their $100,000. The opportunity to end this mess is before the Executive Council. A vote to go to Chicago will be challenged in court, if necessary. Not only would it be a violation of fiduciary responsibility, it would also run counter to the motion on the floor of the 101st Business Session that forbids the board from ending self-publishing without the permission of the Business Session. A year is along enough to make a case for ending self-publishing. The Regime has not even attempted due diligence. They have nothing. Gilbert A. Smith has misrepresented revenue as profits, and he has not adduced any expenses against the $100,000 for anyone to explore because it would be an admission that he lied. Remember, the good CPA reported that the Chicago money was all profit. We have a $55,000 reserve fund added to positive revenue over five years that approaches $200,000. This is a $250,000 advantage to self-publishing. 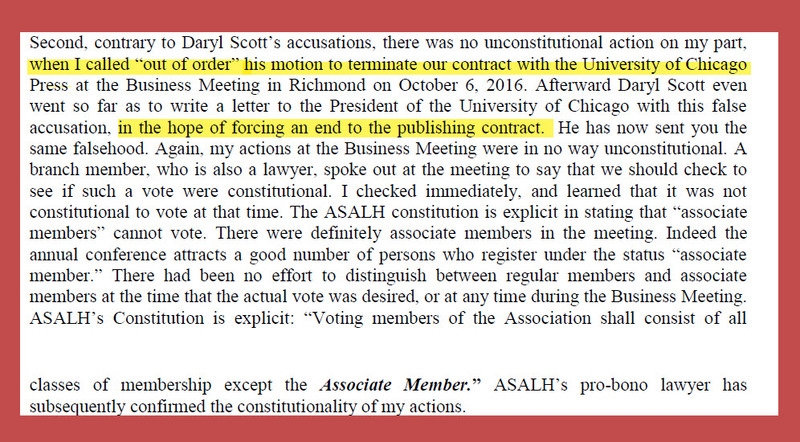 The opposition needs to lobby the fence sitters, and put a motion on the floor the charge the Executive Director of ASALH to sign the contract proffered by JSTOR for the Current Journals Program. Since this effort to sell out ASALH’s century of self-publishing began, I have urged members of the ASALH Executive Board to talk to JSTOR, our twenty-year business partner, to see what they can do to keep our business. Imagine my consternation every time I’ve been told that the University of Chicago Press, the firm trying to win our business, is handling discussions with our existing partner! 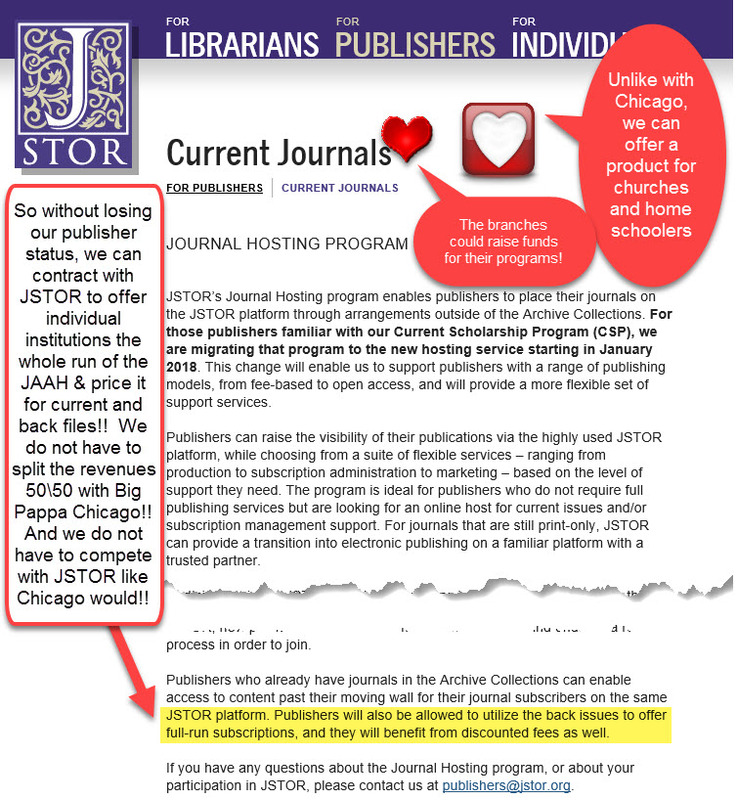 You think Chicago will inform you of what advantages JSTOR might hold for you? Of course not, and for some this heresy was never about money–it was about love and status. When the money was close, it was obscured, but now JSTOR has a new program that reduces our self-publishing cost dramatically and makes it much more profitable to stay independent publishers. 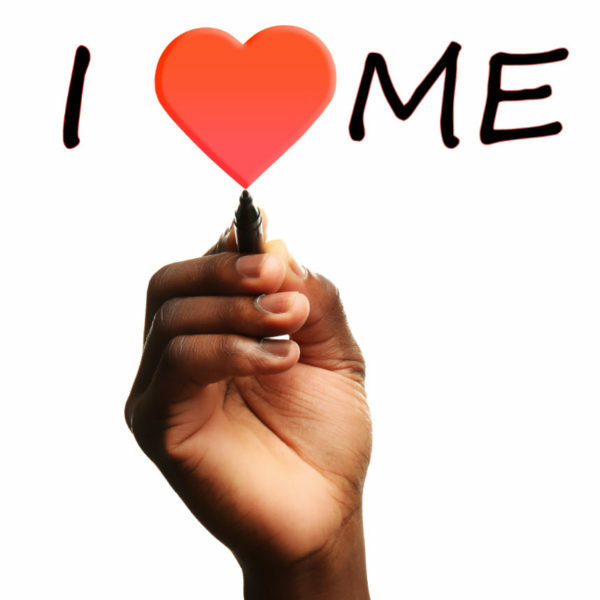 It is now Self-Love versus the Love of Status. Well there is good news! And I knew there would be. JSTOR, which has greater revenue than the University of Chicago Press and is much more profitable, had to respond to the loss of business with the University of Chicago Press and the University of California Press in 2015. That development had to cause a shake up since they constituted the bulk of the New Scholarship Program. Small publisher (and in the world of publishing even Chicago is small) all hoped that JSTOR could save our declining subscriber base by growing our business globally. That failed because the move towards STM globally has limited the appetite for the humanities and social sciences journals from the US in Asia and the Middle East. (Chicago is now pretending it can have success even without its own sales representatives, smh). Recognizing that global and domestic marketing did not result in hardly enough new customers, it is starting a new program that is a godsend to those independent publishers do not want or really need to sign up with a publisher who has not clue on which ways the winds of academic publishing are blowing. JSTOR’s new journals program does two major things. It eliminates the 25% marketing fee. Wow! This reduces cost by more than $20,000 a year. It charges a minimum platform fee–one-third the cost of firms Allen Street. The price in line with a managed hosting wp-press site–but it comes on a stable platform with IP authentication. It charges a fee per subscriber that is similar to a paypal transaction fee and much less than commercial alternatives for closed access. It will allow publishers–that would be us and not Big Pappa–to offer its customers the entire back files of the journal in question. In the past, back files revenues were dealt with as part of JSTOR’s Archive Program only. At the same time, ASALH would be able to pivot from the academy as its primary source of new institutional subscribers and reach out to institutions and groups within the African American community. This is what we have historically done when the university system was not our way of making it in the world. We can enlist our branches and our members to reach out to various civic organizations charters schools to offer a century of black life, history, and culture not simply via the Journal of African American History, but all of our publications. This is bigly!!! With this decrease in cost and the ability to offer a new product, we can grow our customer base without a split if 50-50 with would-be Big Pappa Chicago. If we are independent, we can go to a local foundation and get underwriting for the entire run of all of our journals, including the Journal of African American History, and not share a red cent with the University of Chicago Press, or anyone else. We could reach out to the Urban League or NAACP Act and make Woodson’s independently published journal available to youth who are in writing programs on grants that they have. In the age of austerity, we find a way through as we have for a century and remain the oldest independently published scholarly journal in the entire world!! To bring the point home: this offers ASALH great advantages over Chicago. Unlike with Chicago, we would not have a 50% split of new scholarship subscriptions with Chicago. Unlike with Chicago, we would not have a 50% split 50% of our royalties. Yes, Chicago wants reverse reparations for the century of intellectual property they had no role in publishing. Unlike with Chicago, our back file sales would not be subjected to a 50% split. 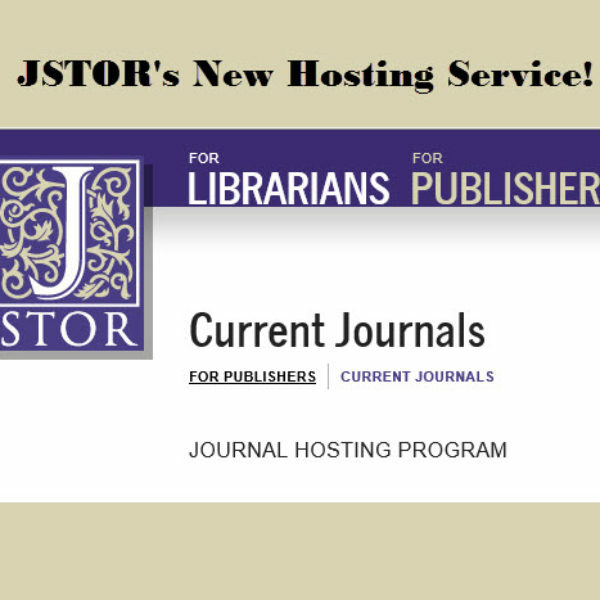 Our new scholarship will continue to be part of the JSTOR Archive program. Why is JSTOR doing this, not love but to protect its JSTOR Archive business. It is a $85,000,000 a year not-for-profit primarily because of the global reach of its archive. Where it failed at selling new scholarship abroad, its archive is gold. JSTOR has decided to create a program that sustains independent publishing because it depends on it. If the regime had done due diligence and talked to our long-term business partner, they would have heard of this program long ago. But it was not their desire to continue self-publishing. They are bent on going for the supposed status of a university press as their publisher even though JSTOR continues to offer services that are at once more stable and sustainable. It is never becoming for historians to enter into the world of historical fiction, and it is wholly destructive for them enter the world of alternative facts. Yet when we get caught in modern-day controversies and are actors as well as scholars, the need to defend untenable positions can lead even the best scholars astray. This has happened in the case of Evelyn Brooks Higginbotham as she responded to my letter to the branches. Her letter is filled with misrepresentations and even alternative facts to justify her position that the Executive Council still has the authority to make a decision on the future of the Journal of African American History. Moreover, she wants to erase or soften the debacle of the 101st Business Session, where we were lied to and disenfranchised for the sake of selling out our history of publishing Woodson’s journal. 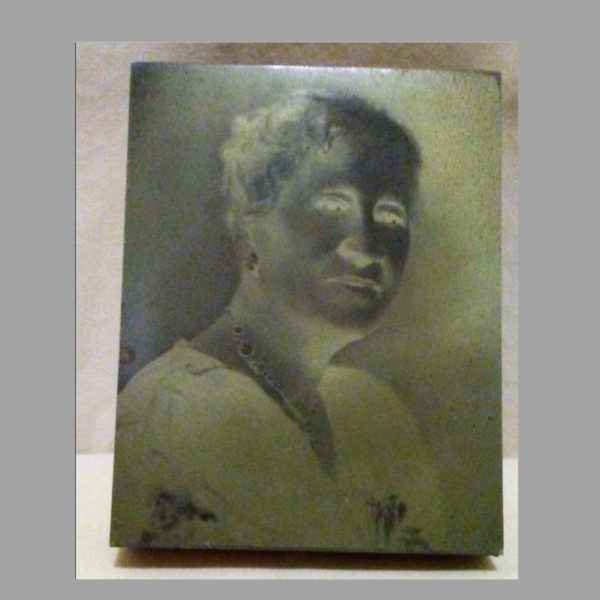 Mind you, she never explains why we have to cease our self-publishing after a century. It is not money, so it must be status. In my letter, I argued that Gilbert A. Smith flat-out lied about the University of Chicago Proposal. He said repeatedly that the $100,000 promised by Chicago was profit, not revenue. How silly. Just because someone says you can do what you want with money they give you does not make it profits. You do not have to be a certified public accountant to know that if you have obligations to pay, it isn’t profits. What alternative world is the President trying to construct? As long as the journal has significant bills to pay–and there are tens of thousands of them to be paid from the $100,000, then the money is not profit. Indeed, Evelyn and VP Franklin both say so themselves in post-meeting statements. After the 101st Annual Meeting, VP Franklin sent out an email in which he said part of the $100,000 would be spent on Journal expenses. In his words: “In light of the proposals submitted to publish the JAAH, there was no need to continue to ‘self-publish’ since the university press would cover publication expenses and guarantee an annual income to ASALH to cover all of the editorial expenses in producing the JAAH.” VP was utterly honest about this. In the letter to the branch members, Evelyn states “It is not fair to V.P. Franklin, now on a retiree’s income, to spend his own money on the Journal.” So, indeed, the money is not profit as Gilbert told everyone. So profits were not profits, they were revenue. 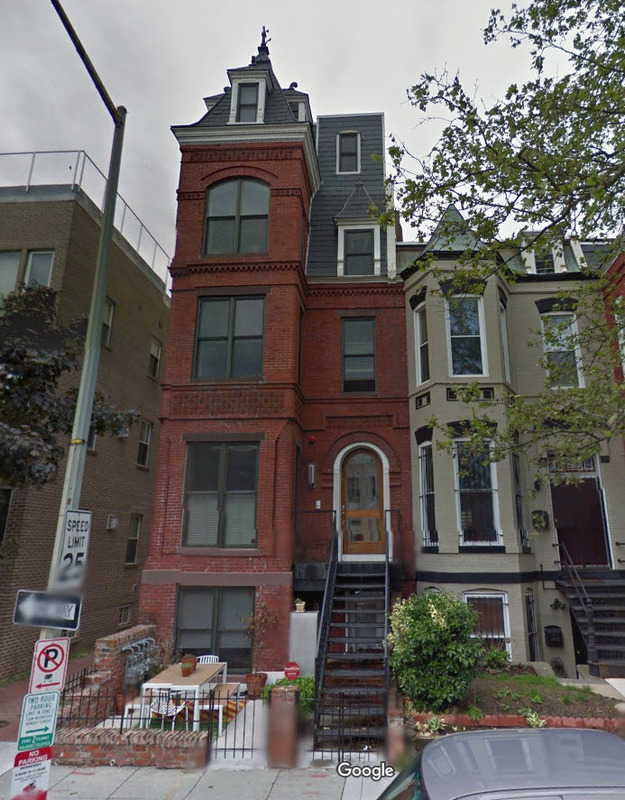 Gilbert A. Smith is not only a Christian gentleman associated with the Shiloh Baptist Church in Washington, DC. as Evelyn of Harvard states in her letter, he is also a Certified Public Accountant who had and has a fiduciary responsibility to report profits as profits and revenue as revenue. To suggest he did otherwise in front of 250 witnesses is to promote an alternative fact. When a CPA represents revenue as profit to a legislative body, he is lying about the business proposal. Revenue reported as profit is an alternative fact. The Sarbanes Oxley Act of 2003, which requires disclosure of financial information to decision makers does not allow alternative facts. Rather than taking the treasurer to task for misleading the people, our president is painting him as a victim. For reasons of status they are dedicated to ending a century of independent black publishing. In my letter, I pointed out that the Gilbert A. Smith and Sharon Harley promised that if JAAH goes to the University of Chicago, the members of ASALH would all receive a hardcopy of the journal. In her long response, Evelyn gives the impression that everyone will get a hardcopy of the journal, then suggests everyone read a letter from Sharon Harley written after the October 6th Business Session and sent out. That letter silently breaks faith with the promise by saying in effect that everyone will not get a copy of the journal as she, Gilbert, and VP Franklin all promised in the meeting. Instead only life members and branch members will get copies. This may go over well with branch members, but what of the graduate students and the regular members who were sold a bill of goods by the president, the treasurer, the journal editor, and the publications committee chair? It is rather clear that the regime, feeling the pressure from the business meeting, went beyond what they had planned in giving away journals. Indeed, in the handout to the membership, Sharon Harley stated that Chicago would pay for all eligible members to receive a hardcopy of the journal. Mind you, the University of Chicago proposal makes no such promise, so any journals received would be paid for out of that $100,000. Chicago charges members $20 for hardcopies. Not knowing the facts, she puts it at 500, which would cost ASALH $10,000 out of the $100,000. The cost to meet the current promise would be roughly $28,000. And the cost to meet the big promise made in the Business Session would be $44,000. The Chicago Proposal makes no such promise of free journals to anyone, so all of these journals will be paid for will come from the $100,000 of revenue. Mind you, ASALH now provides this to members as we self-publish. This means that the financial advantage of selling out shrinks by $20 with each journal given away. Indeed, if the promise made to the membership is kept, then there is no financial advantage of going to Chicago and we would make more money by continuing to self-publish. At the 101st Business Session, the motion I put on the floor was the ASALH to cease and desist in any and all efforts to let any other firm publish our scholarly journals. That motion was seconded and debated but a vote was refused. The president did not say the motion was out of order–and that matters when you are following Roberts Rules of Order, and she had her paid parliamentarian there. Here she is trying to construct an alternative fact by altering the motion I put forward. By claiming that my motion was to break or end an existing contact, she trying to construct an alternative fact. You see, if my motion concerned a non-existing contract then it could be ruled out by a point-of-fact violation of Roberts Rules of Order. This is what she is suggesting happened. By putting an alternative fact in my mouth for my motion, she is trying to change the narrative so she can say she ruled it out for good reason. But, that, too requires another alternative fact–my motion was never objected to before it was seconded and discussed. Indeed, we discussed it for more than thirty minutes before she pulled the plug for other reasons. Below is her material alteration of the motion I made. What I find most disturbing about the president’s response to my letter is that she writes as if no branch leaders witnessed the spectacle. The presidents of the South Florida Branch, the Tampa Branch, the Jacksonville Branch, the Chicago Branch, the Detroit Branch, the Julian Branch, the Manasota Branch, and others were all there. There were innumerable branch members and general members, numbering some 250 people. Many of you and your members know that $100,000 in revenue was called profit. Everyone heard the promise that all members–all members–were promised a hard copy. And you saw the President of ASALH–after my “cease and desist motion” was properly read, seconded, and discussed for more than half an hour was refused a vote. The motion was not called out of order. No, we were told that the Executive Council, not the Business Meeting, could make this decision. And not a mumbling word was heard about Associate Members–and if the president knew anything about ASALH she would know that there are less than a dozen associate members out of 2,200 or more members! This is a scam on the scale of the Republican claims of a tainted voters pool. I won’t spend but a moment on the petty claims that act as filler in the President’s effort to deny that the members now legally own the outcome of the self-publishing issue. Higginbotham is ultimately responsible for having the police sicced on me at the 101st Annual Meeting but she poses as a victim because I said she had done nothing worth talking about before becoming president. She made no significant contribution and she nor anyone else would dare list one. It would be another alternative fact. Her lack of experience is why she does not understand that there will be mailing cost that ASALH has to pay if the journal goes to Chicago. While Chicago will ship the journal, books and manuscripts in various stages of preparation are shipped, often by federal express, to and from the editorial office to headquarters. This high-priced mailing costs about in the $2,000 range. Had the president not rejected my offer to head the publications committee when I was president, she might know that. Enough of the petty. We will stick to our guns. Gilbert A. Smith should be recalled for lying to the membership gathered in the Business Session for representing revenue and profits, and thereby grossly misrepresenting the financial advantage of going to the University of Chicago. And we note for the record that Gilbert A. Smith did not speak up to refute my claim. He knows he is in deep. More importantly, the decision on the Chicago Proposal and any proposal from a publisher cannot be acted on until that 102 Business Session meets in Cincinnati. We will remain strong and firm, and yes we will go to court if necessary. We will not be disenfranchised, and unless it is the will of the membership in session, we will not break faith with our founder. And there is certainly no financial reason to do so. Under separate cover, I will show how the journal can be more profitable self-published rather than published by Chicago. Aren’t You Gonna Vet Your Prospective Big Poppa? 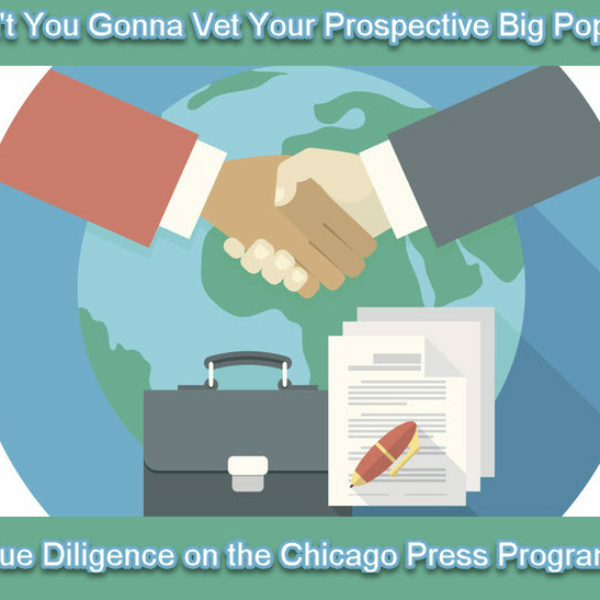 Executive Council members who take due diligence seriously need to vet the University of Chicago Press’s Journals Program. As part of this, the journals manager at the University of Chicago Press should be engaged in a face-to-face meeting before the board. This is a no-brainer for an organization that has been independently publishing its own journal for just more than a century. Ending one’s independence in publishing sends ASALH on a new trajectory that could result in our never publishing our journal again–if this proposal succeeds or the executed contract fails. (Getting back into a business would be neither simple nor cheap and hence not probable.) Chicago itself has made a decision that changes their much out their journals operation. The move was not obvious to anyone. Choosing to build its own platform to service fewer than a hundred journals in the humanities and social sciences seems on the face of it a losing proposition in a world where economy to scale is measured in the thousands. JSTOR and Project Muse entered this business a generation earlier with massive funding from the foundations, and now Chicago, along with the University of Chicago Press, has left JSTOR’s New Scholarship Program in 2015. Few would recommend this course of action unless a new revolutionary business model is being pursued. This, however is not likely, and so the question is whether there is a viable business model. Though Chicago has published journals for nearly a century and a half, they are new to publishing on their own digital platform. Success is far from a given. Because of this, ASALH needs to put hard questions to them. And of the things that have stunned me in this process is the candid admission that ASALH has not spoken to JSTOR about how they could retain our business, but rather have allowed our prospective business partner speak to them in lieu of us for the purposes of undoing our generation-long relationship! Were you experiencing declining institutional subscriptions and revenue when you left JSTOR’s New Scholarship Program? If yes, what was your perception of the problem? Have you rectified it in your own program? If not, was there any economic factors involved with leaving? What role did back file revenue have in your decision to leave JSTOR? Why are you competing with JSTOR Archive in selling your back files? Did you plan on doing this originally? Your publishing house is now in the second year of having its own journal platform thru Atypon and you have the bulk of two cycles of subscription sales and revenue in hand. How goes your revenue? Compared with the last year that you were with the University of Chicago’s New Scholarship Program, please share with us the data on the number of institutional subscribers for your journals. What was the increase or decrease on average per title? What was the revenue increase or decrease on average per title? Based on two year’s experience what are the changes you are considering for your program? How does your overseas sales program differ from that JSTOR had? How many overseas sales representatives does Chicago have? What success have your overseas sales people have? Atypon has recently been purchased by John Wiley & Sons, which is a major commercial publisher of journals with over 9,000 titles. When JSTOR elected to create its own platform, Chicago opted to stay and get its own relationship with Atypon, and so now it in on the platform of a major commercial competitor that is more than a hundred times larger than it is. This could adversely affect the long-term prospect of ASALH’s business. What changes have taken place under Wiley? 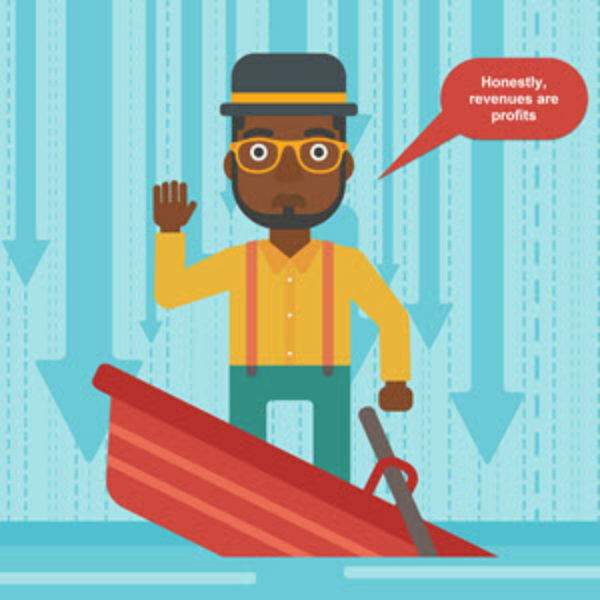 How has these changes affected your bottom line? If increases incur in your platform fees, how will these be absorbed? Will they be passed along as cost? What is your business model for increasing the revenue of the Journal of African American History that allows you to more than double the total revenue of the journal. $200,000 more than doubles our current revenue and we do not split it 50% with anyone. Our journals are priced competitively already among history journals, so do you plan to increase those prices significantly? If so, how much? Does Chicago have its own sales representatives, and if so, how will you do better than JSTOR has been doing. If not, how do you plan to outdo the overseas sales that JSTOR experiences in the New Scholarship Program? Given your pricing of back files, it appears to be the major way you mean to increase the revenue stream. Yet, since our back files will remain on the platforms of Cengage, EBSCO Host, ProQuest, and JSTOR platform and they sell a bundle of over 2000 journals, how do you plan to compete with these firms for back file sales? What percentage of the $200,000 plus in annual revenue do you anticipate coming from back file sales? Given that the century of back files were published by us, it stands to reason that we would get 100 of the sales by others named above. Do you agree? Given that the back file sales that you were also published by us, it does not seem reasonable that you ask for a 50% share of those sales. 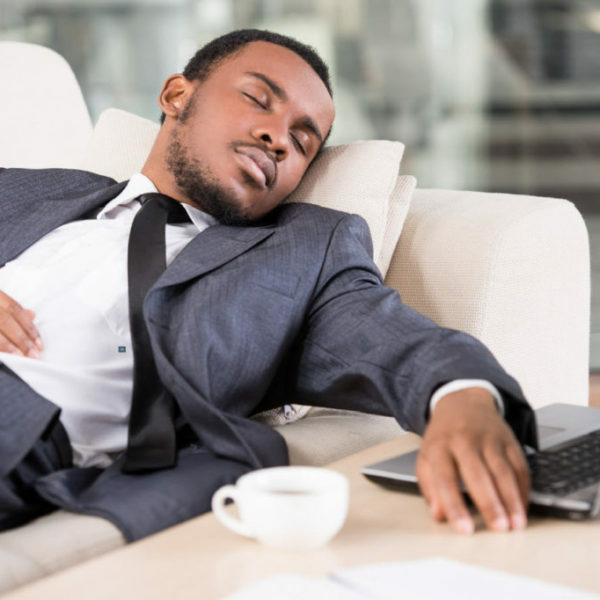 How much do you think you would increase back file that come only from your sales effort? Would you be willing to waive all revenue from back files that others raise from pre-existing contracts with ASALH? Would you be willing to accept 25% on the sales of back files you sale to new customers? I am to understand that you have been talking to JSTOR on behalf of ASALH. If this is true, what has been the broadest scope of those conversations? Has it been limited to ascertaining the cost of terminating the existing contract? Has it included any negotiating the removal of the back files from JSTOR’s platform, which would require amending the existing contract ASALH has with JSTOR? What has been the substance of all conversations on ASALH’s behalf for both JSTOR’s Archival and New Scholarship Programs? If you have asked JSTOR to take the back files out of our archive have they agreed? Would there be any financial consequence for you or ASALH in relationship to either of those two contracts? Embarrassingly False. Publishers are controlling types. In her recent Statement to ASALH Members, Sharon Harley backs off the Big Lie that ASALH will make $100,000 in profit, or any profits at all. She also silently backs away from her promise to ASALH members that every member will receive a hard copy in their mailbox. These falsehoods, made to members in the Business Session, masked the truth–this decision not about money as they were told. Clearly, this proposed relationship is about status, not money. The regime will never admit this, yet what else is there? We have published a century by ourselves, but now, all of a sudden, we need someone to do it for us though there is no economic advantage. Must be status. Now, like lots of people with stars in their eyes, the regime hears what it wants to hear, misunderstands much, puts the best face on countervailing information, and ignores all the warning signs. The regime denies that any control is lost if they take on a publisher. The claim is that ASALH will retain “absolute control.” ASALH will not retain anything close to absolute control. This is false, stunningly and embarrassingly false. Publishers are shot callers. They pay the cost to be the boss. You keep your money in your pocket for production and promotion, and they pay those bills. They do not do this because they like you or love you. Nope, they do this to make money. Now they may be people of substance and put out a quality product, but they do mean to try to make money–or at least try. And to make money, baby, they need control, control where it matters. Here is an image of the relevant section of the document Harley sent out, it covers two pages hence the gap. Oops, no claim of “absolute control” in the quote from Chicago. Back up and read that quote again. Nothing about absolute control in that quote, so the good professor used a block quote that does not support her claim. That passage says ASALH will own the journal and its copyright. Sorry to say, but that qouted passage says nothing about control. Gee, why? In the agreement, ASALH does own the copyrights of things published. This much is true. Yet anyone who has signed on with a publisher knows you do not control that copyright for the period you sign away. 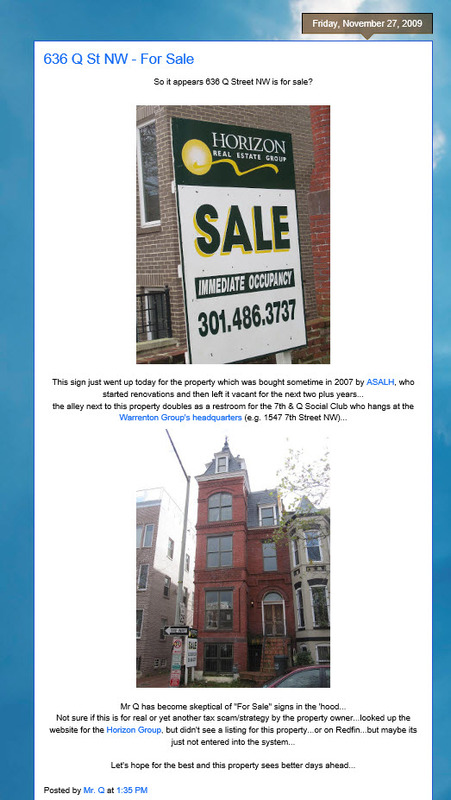 While the contract is in force, ASALH gives up control over the copyrights material–past and present. 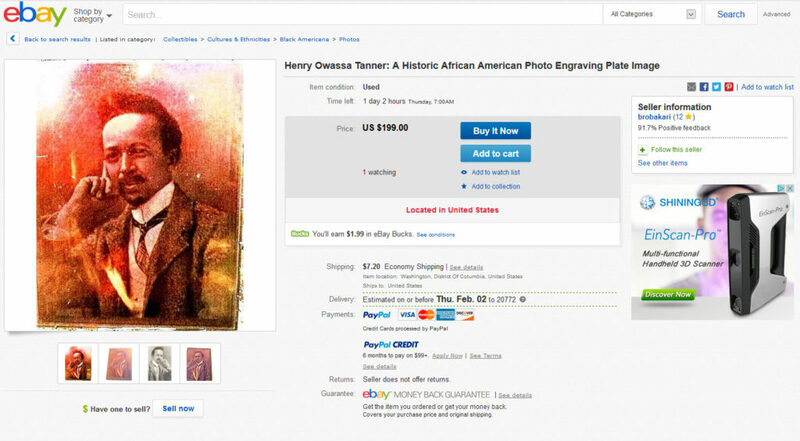 Here this, Chicago will control the copyrights of everything the Journal of African American History has ever published. That’s right, they will control and make money from articles published by Woodson and his generation of scholars in the 1940s. Yes, they will control the past and the present of the content ASALH provides. Yes, ASALH is best seen as content providers, and we will be paying reverse reparations to the University of Chicago. As if Woodson owed Chicago, they will make money from work they never performed. Man, Big Papa is paid for the labors of your father. What did Woodson do to Chicago? 22% of the revenue Chicago has promised you comes from your intellectual property, and you currently make that money without Chicago. They want half of that for getting together with you. ASALH will not control the pricing. 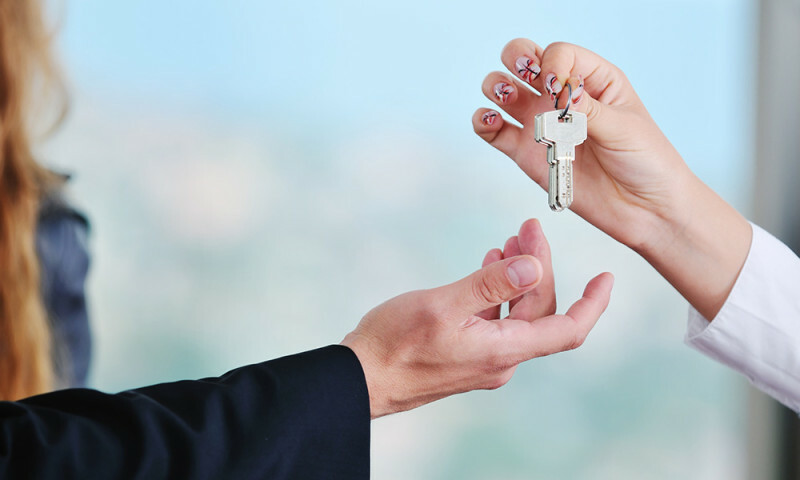 Chicago will set the price not only to institutional subscribers, but also to individuals. This will apply to current and past issues. ASALH cannot do giveaways at the cost of printing. You cannot print out extra copies at printing cost and give them out to schools, branches, and community members. No, no more of that nonsense. Because we are not an academic organization, this is vital to us. We exist for our community, not the profession. Chicago is all about the academy and their business model reflects that. You will have to pay the amount your publisher dictates to give away special issues or any issue of JAAH. If you have a sponsor, as we have had in the past, that wanted 500 journals to give away to the community, you cannot have more printed at cost and walk away with 100% of the revenue. No, that senario now has to be worked through with Chicago. Your journal is a Chicago Journal sponsored by you, not published by you. There is the hard cold reality. Now, the boss man might be willing to do a special run and share the profits with you per your agreement, but how the costs are allocated in such a circumstance is not spelled out in the agreement. You see, Chicago does not have another organization like ASALH so they don’t have his boilerplated, and your attorneys at ASALH, well, they know less about your business than you do. ASALH will not control permissions nor the revenue. Permissions by authors to republish their works would come from the University of Chicago Press as the publisher, not us. The terms of their use will be determined by Chicago, not us. Scholars who have published with us in the past, let’s say a decade ago, will still go to Chicago for permission to use their articles. 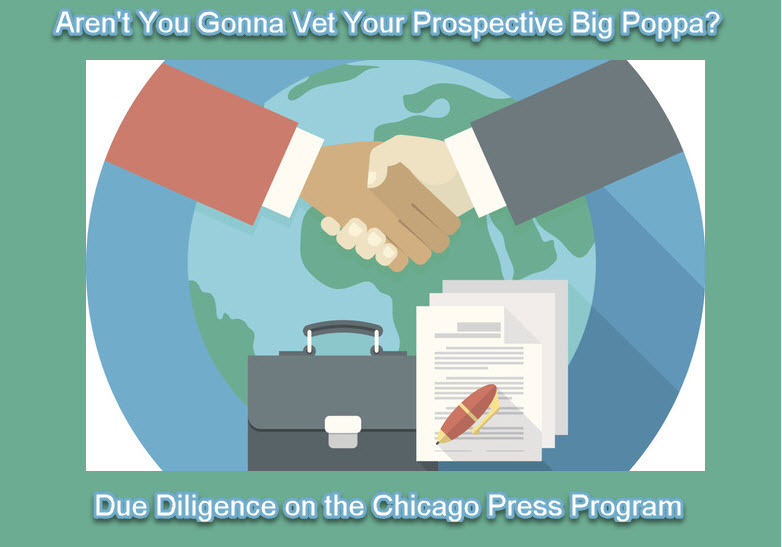 It will be Chicago’s call on how they deal with our authors and their prospective publishers. ASALH will become alienated from its members. ASALH will not control permissions to other publishers who want use ASALH’s intellectual property. If some company wanted to include an essay from the journal in an edited collection justifying disenfranchising black folks, it would be Chicago’s decision, not our. As CUP states on their own website, “The University of Chicago Press can grant permission only for material copyrighted by the Press or the journal’s sponsor.” So, they would have control over permissions, not us. Will Chicago allow electronic publications to carry our articles? Is this good? Do these publishers who use the material electronically via Chicago hurting the value of our catalogue? Not to worry, baby, it ain’t your problem. In general, for no added value, Chicago will reap %50 percent of revenue. Wow! ASALH could not control any other decisions that the University of Chicago Press makes about our content. If Chicago wanted to put out a volume that contained articles from the Journal of African American History and other publications, it could. It would be Chicago’s call. They would split the royalties 50%.On the other hand, ASALH could not decide to do a special publication on something such as financial literary or the history of black women in business based on articles from the past twenty years. No, that decision would belong to Chicago. They would have control over the intellectual property. And if they agree to publish it, or allow it to be published by someone else, they would share in the revenue. Chicago would exercise vital forms of control over the new issues of the journal. 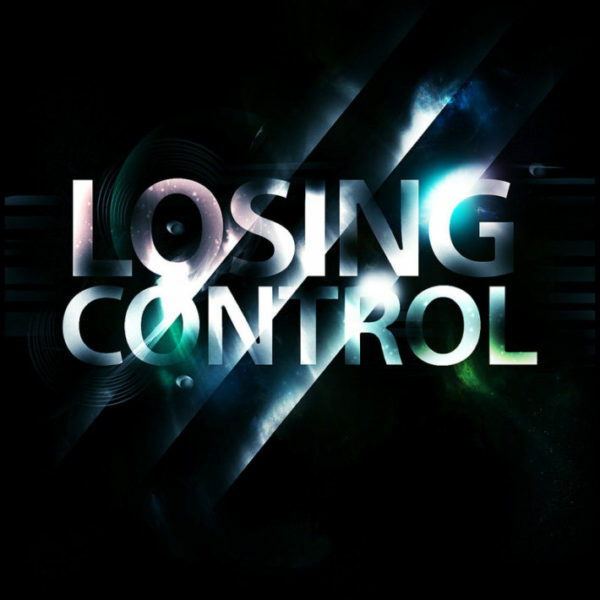 Control is not all about content. While Chicago promises control over content, they do, as all publishers do, decide how much content. The Chicago proposal does not say how many pages will be in each volume, but they will not be unlimited. The idea that the proposal does not spell this out speaks volumes about the state of the negotiations. A six-hundred page volume would cost roughly two-thirds of one nine hundred pages as many costs are tied to page-count. Chicago has promised to pick up production costs–but is it limitless? Of course not. So there is no absolute control when you are not paying the cost to be the boss. When you are a glorified content provider, people will see you for that. For a century, black people and the broader community has seen you as independent, and as such they see you as the folks who speak truth about black people–often against the white establishment. Well, you may see yourselves that way as board members and editors, but the rest of the world will no longer get that image. And because we are not an organization with both feet in the academy, this matters. Many black people will see you as serving the wrong god. You will branded as a “University of Chicago Press journal,” and that is not the gold standard for black folks. When you go to the public to raise money, they will not give you sponsorship money for a journal published by the wealthy university. Rank-and-file people are not giving you money for a journal published by white folks. In the 1930s, Woodson went to the black community and said support us. Those who know you have a publisher won’t give. And hell, you can’t even promise a donor a free copy of the journal for their donation! The other day when the present of ASALH sent out an annual fund email looking for money based on JAAH, I laughed. She does not understand the consequence of selling out. Would we really have absolute control over what Chicago publishes in the journal? The honest answer to this question would be that we do until the University of Chicago steps in for some reason and says they cannot risk letting something be published. As publisher, they are subject to laws and public pressure. If, for instance, someone finds what our editors plan to publish offensive and threatens to sue Chicago or to not donate money to the university, ASALH will find that it does not have absolute control over content. So no publisher can make you an ironclad promise of our having absolute control over content. 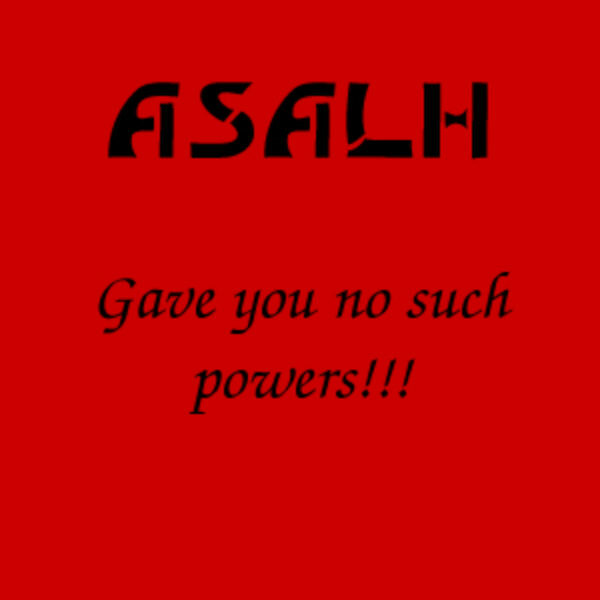 ASALH Did Not Vote for a Dictatorship! 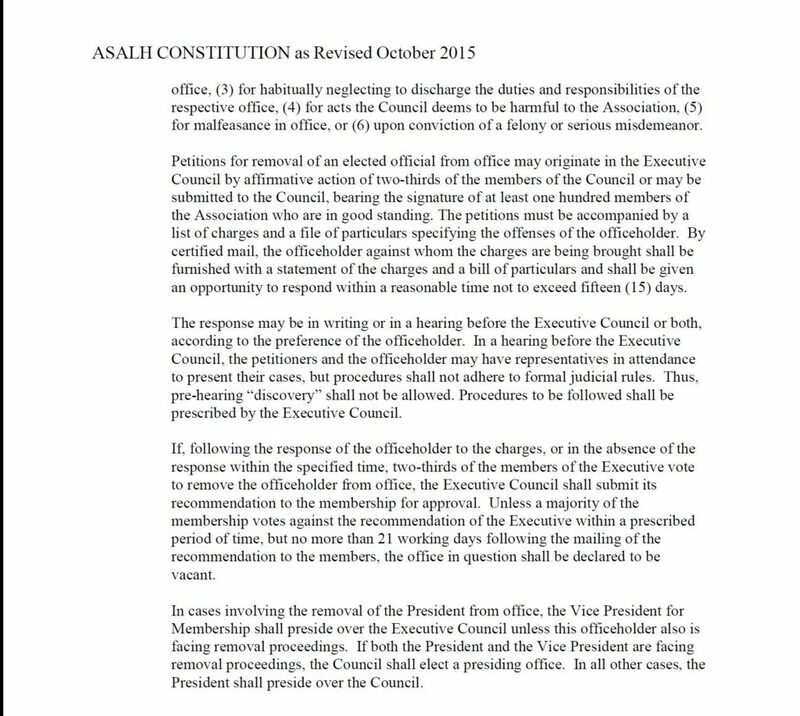 On October 6th, at the 101st Annual Meeting, the President of ASALH and the Vice President of Membership, the two senior officers of our organization, told the membership gathered at the Business Session that they–the members in session–did not have the right to direct the Executive Council. They opined that they were the elected officials and that they could govern ASALH as they pleased until they were voted out of office. This, of course, came in the context of a their shutting down the debate on a motion to continue self-publishing the Journal of African American History. Since then the Vice President of ASALH, visited the Detroit Branch of ASALH, and repeated this violation of the constitution and by-laws. It is time to consider taking constitutional measures to remove them from office. Here are the constitution and by-laws of ASALH, and the appropriate pages governing removal are on pages 5 and 6. The regime is getting desperate and going lower and lower despite claiming the high ground. Now that many members of ASALH know that their leaders lie and disenfranchise them, hard questions come frequently. And in response to why I would oppose this move if it were such a good thing, members of the regime are telling people that Daryl Scott is upset that his company is not being allowed to publish the journal! Yes, folks the claim is that I want ASALH to publish with Godwin House Publishers, a firm I am starting. Let’s review some facts about this struggle. The Get Right with Woodson Campaign has always held that we–ASALH–should self-publish as we have for a century. The T-Shirts that I gave away free at the 101st Annual Meeting say, “Self-publish ASALH.” They do not say, send the journal to Daryl Scott’s start up press. Everything on this website says, “Self-Publish,” and makes clear that is what we were founded to do. I put a motion on the floor of the 101st Business Session of ASALH–legally seconded and still under discussion–that called for the Executive Council to cease and desist from entering into any contract with any publisher without the expressed permission of the Business Session. That was my motion, and it would prohibit the board from taking on any publisher, period. That would include Godwin House Publishers. I have raised $55,000 to create a fund for ASALH to continue self-publishing. I came to the 101st Annual Meeting to deliver the money, and the regime took measures to bar me from the Executive Council meeting. (Hotel security and then the police were looking for me!) Over forty people have given to this fund. I would not begin to suggest any company, including anyone I am associated with, as the way for the future for self-publishing at ASALH. The best method of reducing the cost of publishing the journal will be to outsource the various publishing services to get the best price on each task ranging from copy editing to composition to printing and shipping. (This is what most publishers do today, including Chicago.) This is what ASALH already does for every other publication and this is why they are less expensive to run. So going with a press even as fee-for-service rather than as the publish would not be the way to go. This argument is the same whether we are talking about firms like Sheridan, the Allen Press, Tapestry, or Godwin House. People who have been around ASALH know that I GIVE to ASALH and I take nothing from it. I am usually among the leading individual donors. I have given for over a decade–time and money, and much more time than money. And I will continue to give after we send the sell outs off the board. P.S. 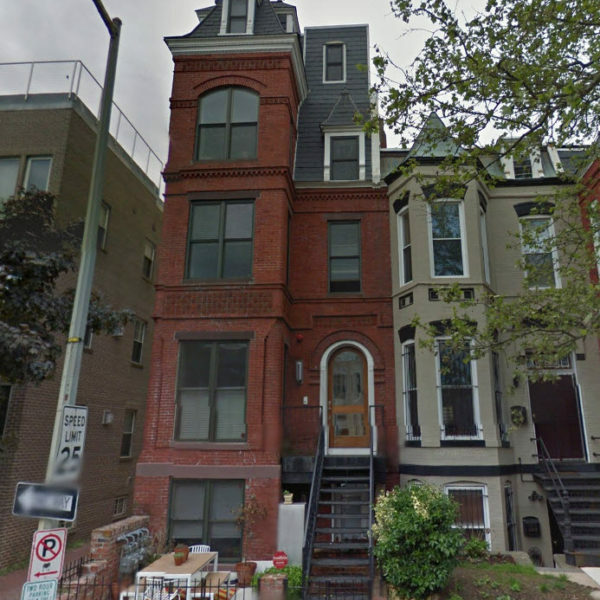 Godwin House Publishers is being built to help underwrite ASALH’s self-publishing. It is a for-profit that aims to donate funds to the Woodson tradition of self-publishing. It will publish projects that ASALH could not take on or have in the past rejected. Most people who know me and talk to me know this too. As library subscriptions decline, there needs to be new revenue to underwrite the Journal of African American History. Even if it goes to Chicago, it will come back because their business model is flawed, and they won’t stop the bleeding–something they probably suspect themselves.